Baseball game. Over a hundred people at the baseball game, but only a few in my sights: my son Chase pitching , and my son Tanner and husband watching him. 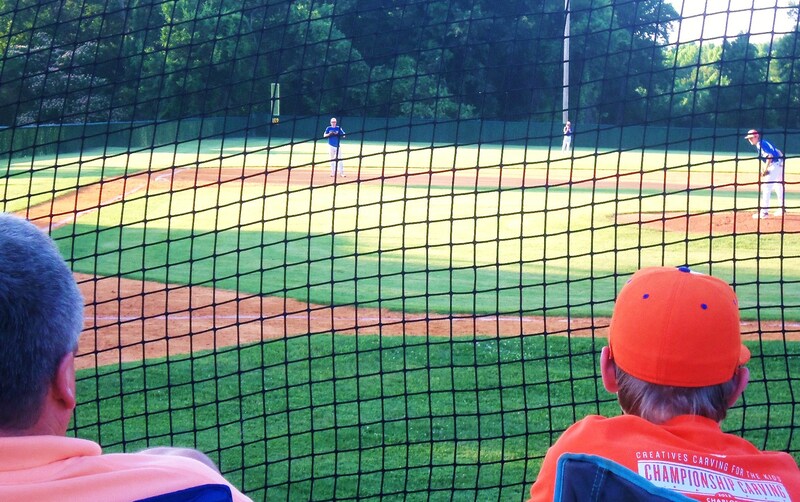 My husband and son wear orange at every game. EVERY game. Never thought I’d see my husband wearing bright neon orange, but it happened this year! My son Tanner on the other hand wears orange as much as he can, and his brother has deemed him a ‘neon glow stick’ because of his choices in clothing. (He was so excited when he found out that his brother’s baseball team colors were blue and ORANGE!) I asked Chase if he wanted me to find a bright orange jersey to wear so we could all match and he smiled and rolled his eyes at the same time and said, “Definitely not!” A bit much, I’d say. I was relieved he felt the same. We do this spectator thing a couple times a week, and I don’t just come to watch my son, I’m watching them watching him, and loving the reactions after each pitch thrown and swing of the bat. Definitely time well spent.